Last week the tournament at Korpen Stockholm presented a remarkable improvement in terms of the way the team performed. However, the score did not tell the full story. As planned the previous week, we managed to find a training center which enabled us to exercise different techniques. Even though the time slot that we booked was short, it did not hinder us from covering some of the most basic routines for a game of futsal. The players who participated that day worked very well on shooting and passing skills. There were expectation that most of the guys from our team would be coming to the training but few showed up. 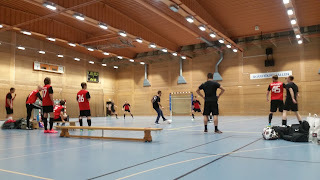 As usual, the next day there was a match with one of the teams from our division. One can realize that they were a well organized team when one observes the way they play. After the kick off, we scored the first goal and it gave us good momentum to control the game. But momentarily the opposing team were able to score their first goal, which leveled the tempo of the game. After the half time break, we eventually managed to score the third goal. Just when we thought we had a better advantage, they were also quick to score the second. And few minutes before the final whistle, they scored the winning goal. Then we tried to level the score by creating pressure but we didn't succeed to do so. Although we could not win the game, many of us were not disappointed. We were rather glad that we are starting to show real progress and learned that it is training that makes the difference. After this week's game, we will have a one- month break from the tournament because of the holidays. The team plans to use this period as a chance to improve performance and intends to obtain it by allocating a training time.